We’re back from our trip. It was one year ago that Oie, Ben and I took our first proto-Sharefish trip to El Carrizo. What a year! 1. 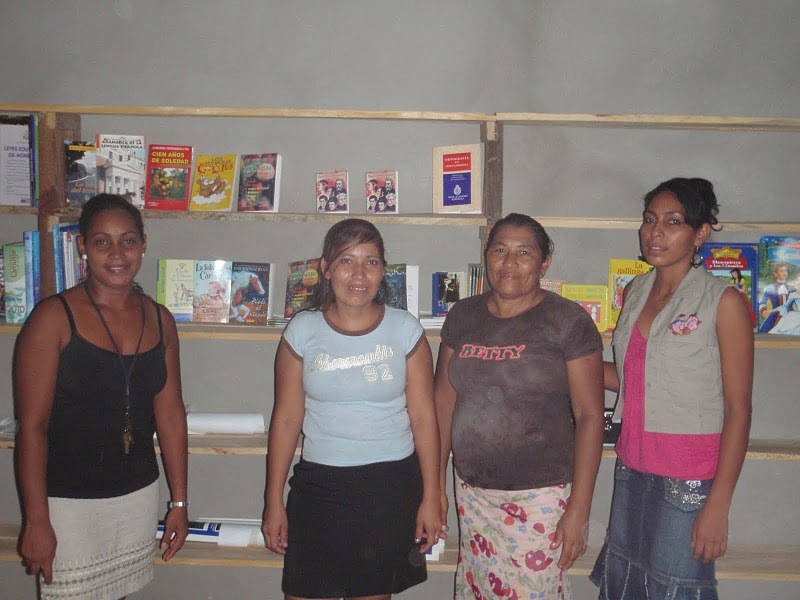 We got the library started in Santa Marta. When we arrived on Saturday a Sunday school classroom had been set aside for the library, the shelves had been built, and four librarians had been appointed who were eager to get started. We made arrangements to meet Sunday afternoon to start working on the books. a. We paired off so that team members could work directly with the librarians and set up four different work stations to prepare the books: (i) taping the backs and edges of the paperback books, (ii) marking the inventory number of each book and the identity of the library on the title page and last page of each book, (iii) filling out the name of the author and book on the check-out cards, and (iv) pasting the checkout card sleeve in the back of each book. We worked until late afternoon on Sunday and then finished up the following morning. c. Next we took the librarians to a bookstore in Choluteca so that they could use the surplus funds to purchase any materials they wanted for the library. This turned out to be a key step for several reasons: (i) it gave them the opportunity to put their imprint on the library – they not only got books, but they bought a couple of maps as well, (ii) it let them appreciate how much books cost, and they spent a long time selecting the books and other materials to fit within their budget (they saved some of the money to buy an encyclopedia that was not available in the store where we were shopping), (iii) it gave us the opportunity to watch how careful they were in making their selections and spending their money. I think this is a component that we should try to incorporate in all of our projects. When possible, instead of us just doing the project or buying everything for the project, we should try to find ways of putting some of the budgeting and buying responsibility on our Honduran friends. d. We scheduled the next afternoon (Tuesday) to talk with the librarians about the Mother Read materials. When we arrived, the librarians had already inventoried, completely prepared, sorted and shelved all of the books that they had purchased. We did some rudimentary training, but this is the area that we will need to focus on in future trips so that can help them better utilize these resources. However, I am confident that those books are already being used. 2. Glenn met with the Pastor Monday morning to participate in the sponsorship distributions. That went very well. The Pastor was well organized and arranged for the parents to meet him at the Baptist Association building. He called each family up one by one to receive their money and sign a receipt. The list matched up with the people and there were no duplicates, etc. The pastor had already obtained report cards for the sponsored children in elementary school, and have Glenn copies. The one girl who is in University did not have a report card yet, so Pastor got a letter from the registrar of the University confirming that she was attending so that he could verify her qualification to receive the money. Report cards have not been issued in Colegio either, but the Pastor is working to get something from their teacher (as an aside, we talked with a lot of the students in Colegio, and know that they are attending and liking school). In short the Pastor has taken very seriously his responsibility to account for all of the money and to enforce the eligibility rules. Glenn was very pleased with everything he saw. 3. We had planned to meet with the teachers on Tuesday, but in true Honduras fashion they were on a one-day strike. We have learned that an agenda in Honduras is at best at best an expression of hope and more often just a joke. We met with the teachers briefly late Tuesday afternoon in the rain to give them their computers and supplies. We did not give them the money to repair the El Carrizo school roof because that had already been fixed. We will discuss how best to work with the schools and teachers at our next Board meeting. It has been an incredible year, thanks to the hard work of so many. Now that we have traction, it will be exciting to see what we can accomplish this next year.